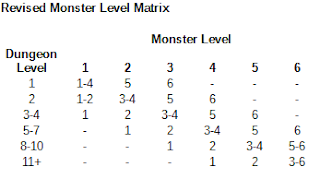 Observation 1: According to this table, on the 1st dungeon level, any of monster levels 1-4 can appear regularly. 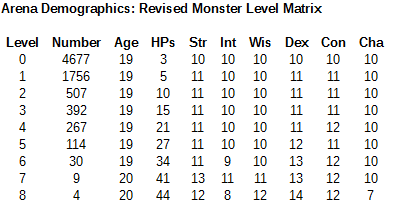 Based on our initial Equivalent Hit Dice (EHD) analysis (link), the average monster on this level is not 1 EHD in power; it’s actually a little over 3 EHD that our 1st-level PCs can expect for a “standard” encounter there. Any one such encounter is a deadly threat, even solo against 4 PCs, say. Observation 2: By the 3rd level of the dungeon, monsters across the entire spectrum can be expected regularly. For example, within a half-dozen encounters, our presumably 3rd-level PCs can expect to confront one 6th-level monster, such as: an adult dragon, 10-headed hydra, vampire, balrog, or purple worm (various EHDs between 12 and 39 for these types). And there’s simply no way that a 3rd-level party can hope to regularly run into encounters with even a solo creatures of EHD in the 20’s or 30’s and expect anything other than a TPK. Note that even after the 12 million separate combats that this represents (the 10K population is constantly refreshed as adventuring men get killed off), it's almost impossible for anyone to have graduated past 6th level. Perhaps more troubling is the fact that their isn't any evidence of higher average ability scores (esp., Str, Dex, Con) at the higher levels; this is a signal that character ability is effectively a non-issue, and affords no benefit in survivability. Basically everyone is just being thrown into a big random meat-grinder. Now, that's still a hard game; while there are more 7th- and 8th-level characters present, still no one succeeded at cracking Name level (after 50 years of adventures by the 10K population). No one can accuse us of giving away the store with this modification; arguably we could dial down the generating matrix even more than this. Note, however, that character abilities do now seem to correlate with survival, especially in the average Dexterity column here (for man-vs-man fights, we've previously seen that Strength is more fundamental). So this might represent a simple and reasonable upper bound for Monster Level Matrix difficulty. Also, if the DM regularly places "special" treasure at a steep multiplier over table-generated treasure (as sayeth the book), then advancement would be more swift than this; at least the PCs would have some chance of surviving to benefit from such treasure caches. Still to come: Monster numbers and treasure value. Reincarnation save successful! We've got OEDGames.com and related websites and email back up and running. If you attempted to send me email within the last week, you should re-send it at this time. Apologies for any difficulties this caused. Unfortunately, the web server running OEDGames.com (and also my associated email) missed its save vs. death a few days ago, and is currently awaiting a reincarnation. Hopefully we'll have a replacement up sometime this weekend. If you happened to send me an email on Tuesday, you'll need to kindly resend it when we're up again. Fight on! We noted previously that numbers for monsters and treasure, in the dungeon in OD&D, were at their root determined by DM fiat. Now we'll spend a few posts trying to massage what is there into a more formal and evidence-based system. Further below, you'll see a complete listing of underworld OD&D monsters parsed into the six levels according to this metric. 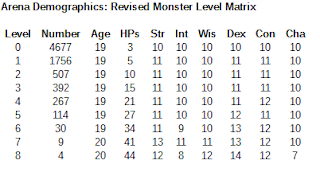 Most monsters stay at the same level as they appear in the Vol-3 book (p. 1011), although there are some notable changes. Also, monsters are distributed fairly evenly across the six levels, with around 16 monsters each on average; fewer at Levels 1-2 (about 10 apiece), and more in the catch-all Level 6. To compare to the book system, you can see an old analysis here, in which shaded rows indicate the original monster tables. The book tables have cutoffs at about EHD 1/2/3/4/6/10. But with better monster metrics, you can see in the link that 3rd level has a big problem with how few monsters it keeps under that rule. If we used that book rule to assess the current expanded monster list, then the problem would remain; only about 9 or 10 monsters at levels 2-3; and an enormous dump of 35 monsters all at level 6. So this strongly indicated that we needed to massage the book pattern a bit for a somewhat better distribution. In the new list below, the third column in the list below also shows the kill ratio attributable to each monster within a level, based on about 2.4 million combat simulations of 4-man fighter parties assaying into a standard-type dungeon, and encountering bands of monsters at equivalent EHD values. (This was generated with the current Arena program using these command switches: -n=10000 -v -z=4 -rk.) Monsters in each level are sorted by increasing kill ratios, so that the whole list runs uniformly from lower to higher danger. The kill-ratio organization also allows us to look for outliers at the start or end of a table, which may argue for incrementing or decrementing the EHD value of any monsters "on the bubble", so to speak, and this was done manually in a few cases. (Specifically, EHDs for the following were hand-tuned based on this analysis: Large Spider, Giant Beetle-Bombardier, Hell Hound, Harpy, Hero, Swashbuckler, Gray Ooze, and Zombie.) As one example, the Zombie (at the newly-recognized 2 HD) is inevitably going to stick out as either the strongest Level 1 monster, or the weakest Level 2 monster; we've set the EHD at 2 so it appears at Level 2 and smooths out the tables sizes a bit. Personae: Brother Maccus (Human Ftr2), Long Tim (Hobbit Ftr2), Aslak the Unclean (Dwarf Wiz2), Tia Birdfoot (Elf Wiz1/Thf3). The party pays living expenses for the past 3 weeks, deletes any rations on record, buys two new potions of healing from the local witch, and then proceeds to the monastery ruins. Descending into the cellars beneath the ruin, Tim notes in the entry chamber that the pile of bones and skins seems larger than last time. The group skirts the wall to avoid it. Eagerly proceed to the bandits lair, where the chief and servant boys were trapped to their doom in panic room (storage crates stacked over trap door). Distressed to discover that they have chopped their way out with an axe, writing "I will return a**holes" on the wall on chalk. Aslak adds "Wangs" to the graffitti. Open the inner trap door and a stone-weight of iron balls pour out on their heads: 4 points of damage to Aslak & Maccus. Treasure is gone. Listen at a nearby door and hear dastardly goblins within in. Break open the door; Aslak casts sleep and 5 of 6 goblins hit the floor; Maccus cleaves the last one in twain with a sword. No treasure found. Twenty feet later, at an intersection, Tia's keen ears detect more goblins, possibly lying in wait, to the west. Party goes south instead to a goblin storage room piled high with boxes, barrels, and sacks; no exit to be seen. At this point the half-dozen goblins cut off the intersection, and throw darts at them; all miss. Aslak charms the largest goblin (whose language he speaks); Maccus and Tim charge into the front row of spears and chop down two goblins. Morale for the others breaks, and they retreat to their guard chamber. Charmed goblin, Ambros, is interrogated and says the goblins have a treasure chest, trapped with darts, unless the proper key is used. Also informs them that further east there are "giant goblins" (bugbears), which concerns party. Looking down the west corridor, they see overturned tables and beds, goblin-spears, and goblins warning them off. Party calls out to turn over treasure; reaction dice say cowed goblins comply. They push out chest and throw the key. Inside: 2,000 cp and 50 gp. Party loads up sacks with treasure, tells Ambros to rejoin friends and murder any bandits if they show up again. Return to village. Treasure split up. Long Tim levels up to 3rd (Swordsman). Tia throws celebration; sets tradition of leveled-up member being forced to eat bowl of garlic and then down a quart of wine. Discussion of whether only one clove of garlic, or one per level. In interest of time, Maccus and Aslak drink healing potions so as to return next day. Return to dungeon and corridors further west. First corridor finds flickering red light to south. Proceeding, look in half-dozen cells on each side; barred windows with an old corpse in each shackled to wall. In end room: a table with two skeletons in chainmail, slumped in chairs, and a fist-sized glowing red gem! Party suspects trap. Maccus notes doors to cells are unlocked; Aslak pounds spikes in to shut them. Takes pole and pokes gem which rolls off table; dead skeleton guards begin cackling hysterically; unshackling and pounding sounds from behind. Party grabs gem and runs, but Maccus is slow. Rolls for animate corpses to force open doors; 3 succeed, cutting off Maccus from rest of party. First one is stout and takes distressing punishment; dagger stuck in skull, arrow shot through throat, and two magic missile spells before he goes down. Another lurches through door but Maccus cuts that down with one stroke. Party escapes. Gem found to be clear glass with magic light that flickers red. Further east, party sneaks past pair of wood-store chambers with many giant fire beetles. Enter large storage hall with mostly empty and smashed crates along walls, stretching to south. Exit via side door to west. First small room: Pile of smashed wood, wood and walls stained reddish up to waist height. Second room: A 10' wooden vat with brass pipe through south wall. Following pipe: A room with 5' depressed floor, a few inches of filthy water within. Aslak steps through to look around next corner. Surprised to find himself trapped by giant acid amoeba, his boots already disintegrating off his feet! Party jumps to rescue, Maccus tries but fails to pull him out. Chops with daggers and swords, lantern fire applied to no effect. Aslak gruesomely consumed by the ooze, skin and flesh sliding off his bones. Tim finally chops the thing to death, but his sword disintegrates into fragments in the slimy mass. Party proceeds past room with several old empty barrels. Enters large L-shaped chamber with many old barrels in wall racks, mostly broken and empty. Turns corner to find many nests in the barrels; 3 stirges appear. New dwarf shows up: Jam Falcon, "Hey, watch out for those stirges! "; throws dagger, bit by stirge for 6 points, immediately dies. Swordsmen chop two down; 5 more fly out to attack. Party runs and succeeds at slamming door shut to cut them off. New dwarf shows up: Banjo Saskin. Conveniently brings spare sword for Long Tim. Group proceeds back to storage chamber, finds three doors in lower part of large chamber (east, south, and west). Listening at central door, succeed at hearing normally quiet bugbear voices. Try to force open door, Maccus fails initial roll. Group runs to westernmost door and bursts into same room that way, catching bugbears ambushing first door by surprise. Banjo charms bugbear in center of room (DM note: winds of magic say this is a one-time occurrence). Group mass-fires attacks at bugbear near door to no effect; he twists and dodges, several arrows sunk in door. Smashes Maccus in armored leg with large spiked mace; rather frail Maccus reduced to 1 hit point. Bugbear at other side of room throwing spears. Charmed compatriot attacks him, misses. Maccus, Tim, and Tia finally fell first bugbear. Tia hides behind boxes for backstab. Tim and Maccus cut down the remaining one. Treasure chest found; searching for traps, skittering sound within. Charmed bugbear interrogated; what is it? Pet giant centipede. Any way to prevent it from coming out? No, it always jumps out tries to bite the opener. Bugbear opens chest and giant poisonous centipede indeed jumps and furiously bites neck, arms, ears, etc; thick-skinned bugbear laughs it off and offers party to pet it. Party declines and takes treasure instead; 1,000 sp and 100 gp. Bugbear ordered to stay and kill any human bandits he sees. Back at village, party splits treasure and XP. Brother Maccus becomes 3rd level (Swordsman). Arranges room at inn to rest & recover, as he will require 4 weeks to heal from his fractured leg and other injuries. The goal of the D&D game is, in some sense, revolves around the monsters and treasure. We defeat monsters, and accumulate their treasure. These are precisely the two things that generate XP in classic D&D. The goal of this blog, as is perhaps obvious, is generally to analyze the system present in Original D&D. However, at its essential root, we are forced to admit the following (despite what appears to be a system of well-defined tables and the like): the quantification of both monsters and treasure in Original D&D is ultimately by DM fiat. In some sense, there is really no well-defined system for either of these subjects in the books. Let’s take a closer look. The monster(s) can be selected by use of the Monster Determination & Level of Monster Matrix which is given later in this booklet. The number of monsters is best determined by the level being considered and the kind of monster inhabiting the room or space. The Monster Table from Volume II can be most helpful here. Number of Wandering Monsters Appearing: If the level beneath the surface roughly corresponds with the level of the monster then the number of monsters will be based on a single creature, modified by type (that is Orcs and the like will be in groups) and the number of adventurers in the party. A party of from 1-3 would draw the basic number of monsters, 4-6 would bring about twice as many, and so on. The referee is advised to exercise his discretion in regard to exact determinations, for the number of variables is too great to make a hard and fast rule. Now the advice in the first sentence here fundamentally makes no sense as a balancing principle. If Orcs are the same individual strength as some other 1st-level monster – Spiders, for one example – then you simply cannot have the former appear in large numbers, and the latter in isolation, and have them both represent the same level of danger. But the rest of the advice here does synchronize and basically repeat comments elsewhere in important ways (ways which one might not expect, judging from later published adventures). To wit: (1) The number of monsters should be scaled to however many PC adventurers show up (as in the footnote in Vol-2, p. 4). (2) The number of monsters is ultimately up to the DM’s discretion, with no “hard and fast rule” one way or the other (echoing Vol-3, p. 6). TREASURE TYPE... it must be stated that treasure types are based upon the occurrence of a mean number of monsters as indicated by the number appearing and adjustments detailed in the explanatory material particular to the monster in question. Adjustment downwards should always be made for instances where a few monsters are encountered. Similarly, a minor adjustment upwards might be called for if the actual number of monsters encountered is greatly in excess of the mean. The use of treasure type to determine the treasure guarded by a creature in a dungeon is not generally recommended. This specification is in line with the somewhat more cryptic advice on monster “Number Appearing” in Vol-2, above (“used primarily only for out-door encounters”). We conclude that the entire Vol-2 system of monster numbers, in-lair %, and treasure types, is for use only in the outdoor wilderness setting. Another point of evidence comes from the D&D Monster & Treasure Assortment product, for use in keying dungeons only (introduction, 1st paragraph), which was produced by a school-aged Ernie Gygax rolling on that Underworld treasure table in Vol-3, and not by monster Treasure Types (Ernie remembers it was in the LBBs, per message on Facebook 2/19/18, but not the exact table – although we can logically deduce it was from Vol-3, because that’s the only one keyed to dungeon level as is M&TA). 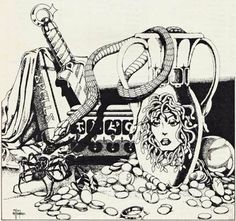 A third point of evidence is in Strategic Review #1 (1975), p. 4: the solo-dungeon system specifies treasure with monsters as "According to the type indicated in D&D, Vol. III for 'Outdoor Adventures' with pro rata adjustment for relative numbers." (A little scrambled, because treasure types are in Vol-2, and here they are in fact being used in the dungeon; but the intent seems clear that by design treasure types are for outdoor adventures, and also scaled by monster numbers, as in the later MM.) In AD&D, the dungeon treasure table is missing from the core DMG text (excepting perhaps one in Appendix A), so a pure AD&D player can be forgiven for not knowing where there was any positive rule for dungeon treasure. So the foundational process is really this stage in which the DM must “thoughtfully place” the most important (largest?) treasures... and apparently this could be anything, as no further quantification of this advice is given. In fact, consider the following: in the random determination method, the vast majority of the treasure value is in the very rare, very high-value gems and jewelry. Compared to the overall “average” treasure there, any treasure with gems has double the expected value; and any treasure with jewelry has about ×20 the expected value. So if we take the quoted advice above in the most literal sense, then Gygax is recommending that the foundational DM-placed treasures represent anywhere between ×2 and ×20, or more, in gold value compared to the treasure that appear in the random table. It could legitimately be almost anything and still be in line with the rules-as-written. What are some of your rules-of-thumb for quantifying the “most important treasures” and monsters in an OD&D dungeon? Cubic dice were brought by the Romans to the Low Countries, and are found in small numbers at many archaeological sites dating to the last 2000 years. We report on a systematic analysis of 110 well-dated dice from the Netherlands, showing that shape, pip configuration, and pip style changed significantly for bone and antler dice from the Roman to the recent historical period. Dice predating 650 CE are highly variable in all attributes, those dating between 1100 and 1450 are highly standardized, and those post-dating 1450 CE are standardized for some attributes, such as symmetry and configuration, but variable for others, such as material type. There is also a major shift from “sevens” to “primes” and back to “sevens” pip configuration across these temporal windows, and pip style was simplified over time from a dot-ring-ring pattern to simple dots. 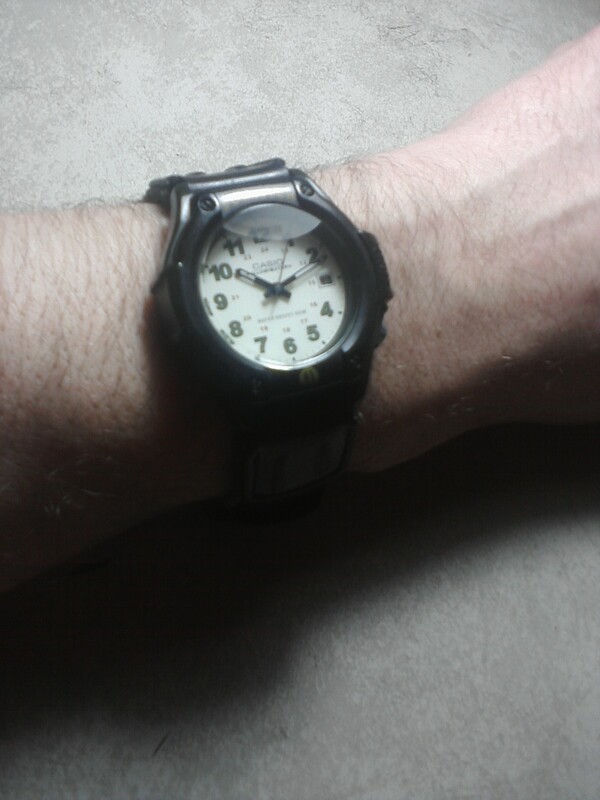 The reason I'm doing this is to combat my own cognitive biases about perception of time as the DM. We're all familiar with the advice that if the action drags, the DM can start rolling dice as a random encounter threat (possibly real or vacuous) to hasten the action. For example, DMG p. 97 cautions about a "boring session", and suggests, "Mocking their over-cautious behavior as near cowardice, rolling huge handfuls of dice... might suffice." But the problem with that is that the DM's perception of "boring" may not be exactly the same as the players'. 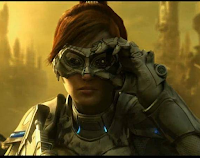 If the players are deeply engaged with strategizing and planning, or character role-playing if that's what they like, or whatever, then perhaps that's not so bad a thing after all. While I want to be hospitable and support all of that, I'm just a bit suspicious that my own sense of time might be different while I'm not on the critical path of the action. And I don't want to prioritize my own sense of what the pace should be over everyone else's. So, keeping the wandering checks (such that there's a legitimate pressure to use time wisely and proceed forward at some positive pace), but putting them on a strict clock (so as to make the pacing objective and not tainted by the DM's sense of time), seems to feel very nice right at the moment. This is a very "gamey" strategy, in line with my tendency to make almost all dice rolls in the open, to try to make the mechanics as transparent as possible, etc., and likely not suited for "deep narrative storytelling" type style. But if you're reading this blog, that latter description probably doesn't apply to you anyway. Consider it for a session and tell us how it feels.